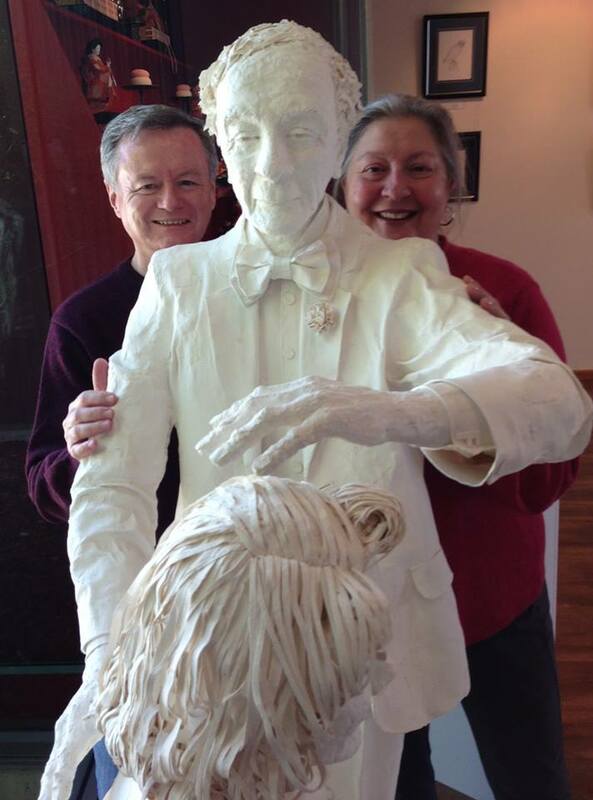 Two of today’s Alexander Technique teachers, Terry Fitzgerald, from Sydney Australia and Pamela Blanc, from Los Angeles, standing behind a sculpture of F. M. Alexander at the Wynyard Historical Society. Wynyard, in Tasmania, is where Alexander was born. In my previous blog, To Outsource or to Insource, That is the Question – Part 2, I wrote about the unique self-investigation process F. Matthias Alexander, the developer of the Alexander Technique, went through to solve his voice problem. Outsourcing his problem to vocal coaches and doctors hadn’t worked. But his decision to take matters into his own hands – to insource, as it were – was fraught with challenges he had no way of anticipating. Today, a person in his situation, well-connected in the theater world, might well go to a teacher of the Alexander Technique for help! And it’s quite likely he would have learned how to solve his voice problem in a few weeks or so, perhaps even more quickly. Alexander Technique teachers today vary enormously in how we teach the Technique. However, we have in common a desire to wake our students up to the power of looking within for solutions to their problems, whether they be performers, or people with chronic pain, or those who want to improve their posture. We make it clear to their students that we are teachers, not therapists, and that the real work of change has to come from the students themselves. Students cannot outsource their problems to an Alexander teacher – they need to learn how rely on their own resources, just as Alexander did, but with the huge advantage of being able to draw upon all the discoveries Alexander made, and the many, many refinements of those discoveries made in the nearly sixty years since his death. When I introduce this direction to a student, usually in their first lesson, I go to great lengths to show them simple experiments they can do on their own to verify this is in fact a useful direction. And I emphasize that there is absolutely nothing they need to do to make it happen. They don’t need to concentrate on the direction, or try not to forget it. Nor do they need to understand what it means! I also point out that while the process is extremely simple, that does not mean it is always easy. There are all sorts of classic “traps” that can get in the way of successful implementation of Alexander Technique directions. To cite but one example, it is all too easy to get caught up in the positive results of a direction and loose track of the direction that brought them about. I tell my students they are a little like the general of a huge army he has arrayed to invade the enemy’s territory and who, when the moment is ready, turns to his second in command and says, “OK, begin the invasion now.” General Eisenhower’s crucial decision of precisely when to invade Normandy in World War II is a classic example. The general’s job is to make the big decisions – in this case the timing of an invasion – and to insource the details to the officers and men below him. He certainly doesn’t want to deal with a personnel problem in Company D, for example. That’s someone else’s job – someone far, far down in the army’s hierarchy. Just as with Alexander Technique directing, this seems like a fairly simple process. But in practice, once the invasion has begun, the general is likely to be getting all sorts of conflicting streams of information and advice that can easily distract him from the big decisions he has to make. We humans have a brain whose job, among other things, is to convey big picture intentions and leave their implementation to the “lower level” systems in our body/mind. These “lower level” systems are able to do that far more effectively than our our conscious brain can. Especially if we stay out of their way, leaving the messy details to them. So, by all means outsource whatever you can. But there are some tasks that just cannot be outsourced, such as commanding an army. Or taking command of our patterns of thinking and moving.